People around me have always dreaded my MNS (Mystery Novel Syndrome) more than my PMS. I was hooked to reading mystery novels from a very young age, when I started with Hardy boys. Later I moved to Nancy Drew, Agatha Christie, Alistair Mclean, Sidney Sheldon, Dan Brown and many more authors. Sorry to say, but I always avoided reading Indian authors when it came to mystery novels because I did not believe they could ever match the skills of the authors I was already exposed to. I loved reading Indian authors when it came to non-fiction or books like Malgudi days, but mystery novels were always a big NO. When I held the book ‘The Bankster’ in my hand, I heaved a sigh thinking why I decided to read this book. I could recall all the employees of the banks I have visited coming into a mystery novel and shuddered at the thought of them acting as James Bond or Sherlock Holmes. With some effort, I pushed out all the negative thoughts and prejudices I held against Indian Mystery Novel authors and decided to have a go at this novel. Unbelievable, I raced through the 358 pages , nd 47 chapters, holding my breath, only stopping in between to attend some absolutely unavoidable work. Even for a reader who has enjoyed books like ‘The Firm’, this financial crime proved enough saucy and interesting. The attraction lay in the Indianized English used by author, which is subtle but will not escape the Indians, who will love it for a change. The sub plots of the story are well knitted into the main story, with a speedy narration building up the mystery before unraveling it in with a twist. Yeah! What is mystery novel without a twist in it? I have to admit that banking is not something I knew until now, neither it is something held inside those small offices I walk into to make deposits or withdraw cash. The intricate process of real big time banking is explained in great detail by the author, which is going to change the perspective of many simple readers like me who have had no previous knowledge about banking. The author has chosen to explain and put stress on what he knows best, i.e. Banking, while not getting into complex details about diamond industry, weapons or nuclear reactor plants. Smart guy I would say. Instead of a detective , we have a journalist and ex- banker - Karan (at least we can easily pronounce the name)donning the role of hero, who goes on to unravel the mystery of series of bone chilling murders that shakes the foundations GB2. The novel has Global conspiracies, interesting plots, secret dark characters, and race against time, all essential ingredients for a chicken soup for mystery novels. 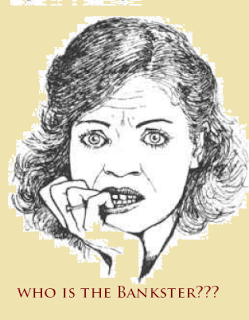 I am kind of scared to discuss the plot over here, because being a woman I may talk too much revealing the Bankster (a cross breed of gangster and banker) to the readers. The thrill of reading the novel lies in guessing what to expect, while knowing deep within your heart that what you expect to happen is going to be replaced by the unexpected. The story begins in Angola, where a secret CIA agent exchanges weapons for raw uncut diamonds making some big bucks in the process. Right then we is airlifted to Kerala where an elderly man, resort owner Krishna Menon is trying to avert a replica of Chernobyl in his hometown. He had lost his son to the accident that took place in the power plant. The next subplot appears in the form of mysterious deaths of GB2’s key employees, which comes out as suicides or accidents. How are all these people connected to each other? The answer is unraveled by Karan Punjabi, who loses his close friend to the conspiracy and is hell bent on discovering the truth hidden by lies and treachery. I was shocked that the bankster turned out to be none other than #$%^&&&.. ha ha there….. just stopped myself in time. I would recommend the book for readers who enjoy mystery novels, and those who do not feel upset with a sneaking Hindi word here and there. Finally I would like to thank Ravi Subramanian for coming up with a good book that has allowed me shed my inhibition against Indian authors who write mystery novels in English. Wish you all the best! Publisher – Rupa Publications, 2012. This review is a part of the Book Reviews Program at BlogAdda.com . Participate now to get free books! heard only good things about this book, I love to ready mystery too when i get time .. read almost all of sydney sheldon .. It was nice to read your inhibitions, choices and views about the book. It is great book with a little loose ends here and there..I had posted my views as well. 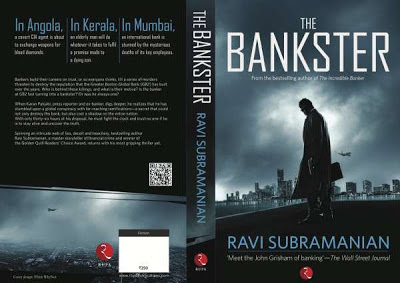 Thank you for the interesting review, hearing about 'The Bankster' first time. I am also a fan of mystery novels. I want to read it by the way..
the direct lender will not lend you any cash. debt consolidation services basically behave like your bookkeeper. the advance varies from one provider to the next.